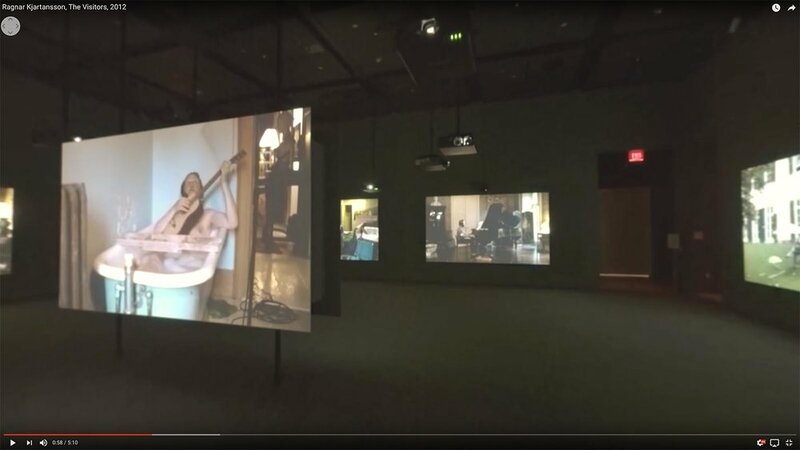 In December 2017 I was lucky enough to experience Ragnar Kjartansson's immersive performance video "The Visitors" at SF's Museum of Modern Art. Still from a 360 video made of the room-sized experience of "The Visitors". This is a piece about eight musicians who play a single poetic song in separate rooms (with the artist himself naked in the bathtub), recording their separate tracks in sync in a single continuous session as others play and sing on the porch. Experiencing this with a room full of nearly 100 people was a communal experience in the highest calibre immersive video. Physically immersive experiences are the stock-in-trade of British experiential collaborative Punchdrunk. They produce the most engaging and elaborate physically-based experiential opportunities for us to see where all this can go... way beyond 360° video. This week's episode of the outstanding podcast "Voices of VR, by Kent Bye" brings us a fascinating conversation with Punchdrunk's Creative Producer Colin Nightingale, the man responsible for spearheading what's arguably the most influential immersive experience on the planet... the 100-room reinterpretation of Macbeth in NYC, "Sleep No More." I heartily recommend that you listen to Bye's interview with Nightingale, and that you peruse the other great podcasts in the Voices of VR catalog. Even if the material isn't directly relevant to 360° video, it's important food for thought because we're all trying to do the same thing... provide viewers with an experience that will change their perspective on the world.